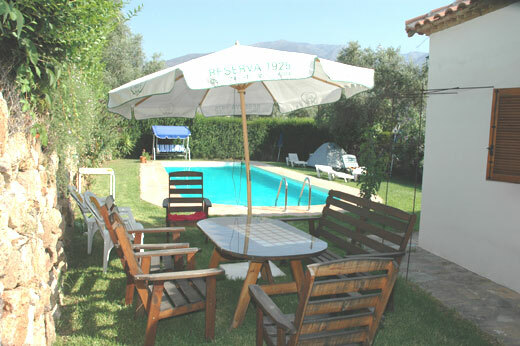 A secluded 3-bedroom villa with a large private pool and large garden, in a serene rural location amidst orchards, close to town. English language satellite TV, broadband. El Olivo is a mile and a half from the centre of �rgiva and is situated in serene, picturesque countryside amidst orange and olive groves, with panoramic mountain views. The tall hedge provides complete privacy round the pool and in the large garden. This is a perfect place for a peaceful holiday. There are three bedrooms (two with a double bed, the third bedroom with two single beds), a living room, a bathroom, a fully equipped kitchen with a dishwasher and a washing machine. 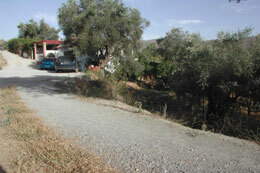 Outside, there is also a huge sun terrace with panoramic views of the moutains. A cot and a high chair are available if required. The filtered pool 12m x 5m is for the exclusive use of guests. 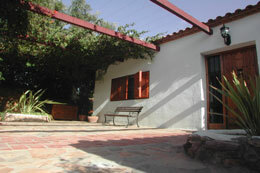 The large enclosed garden, with its well-kept, English-style bouncy lawn, surrounded by a tall hedge, and - in parts - by a wall, allows for entirely private sunbathing, and has ample, comfortable seating: a double rocking chair, six sun loungers, and a table for six for al fresco dining by the barbecue, built in the traditional style. As the house and garden are on one level only, this house can be recommended for those who find walking difficult, and it provides a safe environment for children, as long as they are supervised at all times around the pool area. Child minding can also be provided. The sun terrace is the only part of the house that requires walking up the stairs, but it can be kept locked for the safety of children. 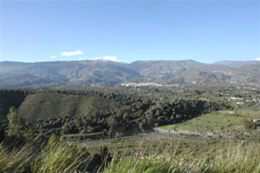 The market town of �rgiva lies in the valley which separates the dramatic mountain range of Sierra Nevada to the north from the Sierra L�jar to the south, seen in the photo above. 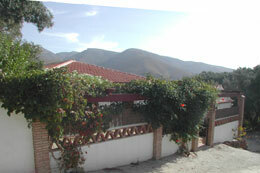 From the garden of El Olivo, you can enjoy a very much closer look of that impressive mountain range. 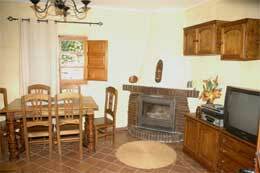 The living room has a fireplace, and a cosy seating area with two large, comfortable sofas, as well as a dining table for 6 people. 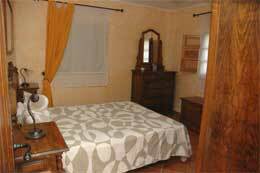 The bedrooms have wooden shutters, to keep out the sun, if you fancy sleeping in. El Olivo is a very comfortable modern villa, built in contemporary style, and with all the creature comforts you would expect, yet with attractive architectural details such as a tiled roof, wooden window shutters, Moorish style arches, wooden beams or a stain glass window. The fully fitted kitchen is completely equipped: big stainless-steel fridge-freezer, dishwasher, gas oven with hob, microwave, dishwasher and a washing machine. There is a good range of the necessary utensils, as well as an electric kettle and a coffee maker.The bathroom, tastefully tiled in a white and green mosaic tiles, has a bath as well as a shower. 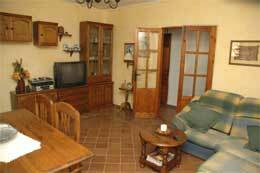 The living room has a couple of large, comfortable sofas, as well as a dinner table and chairs. 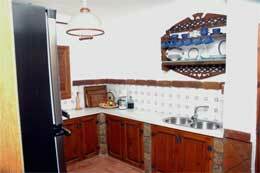 The TV receives both Spanish channels and satellite English language TV. There is a DVD player, a CD player and a broadband Internet connection. Thanks to wooden shutters and the thick walls, the bedrooms feel pleasantly cool most of the time, but fan heaters are available if required. If needed, baby-sitting can be arranged. A deposit of 25% is required with booking; the balance to be paid on arrival to the owner. 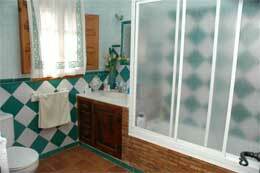 LOCATION: 1.5 m from �rgiva (most facilities). The nearest beach is at Playa Granada 32km/25 miles/35min away, with a golf course and a restaurant. The nearest seaside town is Salobreña, 35km/ 27 miles/40 mins away, with all facilities and a Moorish castle on a towering rock. There are plenty of unspoilt coves to explore, with very private swimming possible. Granada with its Alhambra Palace and a mediaeval cathedral is 45km/33 miles/50 mins away. The ski resort of Sierra Nevada is in the mountains between �rgiva and Granada. Many charming Andalusian ‘white villages’ are 20 minutes drive away. P and O Ferries run from Portsmouth to Bilbao/Bilbo and Brittany Ferries run from Plymouth to Santander. The ferry takes about 24 hours and both ports are a day's fast driving (or two days' relaxed driving) away from Órgiva. 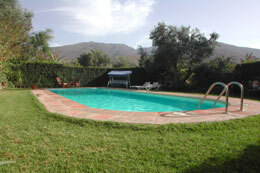 NOTE: Subject to inclement weather, the swimming pool will be filled from 5th April until 25th October, 2008.